A geoglyph is a large design or motif (generally longer than 4 metres) produced on the ground and typically formed by clastic rocks or similarly durable elements of the landscape, such as stones, stone fragments, live trees, gravel, or earth. A positive geoglyph is formed by the arrangement and alignment of materials on the ground in a manner akin to petroforms, while a negative geoglyph is formed by removing patinated clasts to expose unpatinated ground in a manner akin to petroglyphs. A variation of the geoglyph, in the form of three-dimensional positive geoglyph, formed by seeding vegetation in a predetermined shape that typically only becomes visible years after the initial planting or seeding, has been named an arborglyph. Perhaps the most famous geoglyphs are the Nazca lines in Peru. The cultural significance of these geoglyphs for their creators remains unclear, despite many hypotheses. The "Works of the Old Men" in Arabia, "stone-built structures that are far more numerous than (the) Nazca Lines, far more extensive in the area that they cover, and far older," have been described as geoglyphs by Amelia Sparavigna, a physics professor at Politecnico di Torino in Italy. The use of this term to describe these features is probably inaccurate, as recent research has shown that most were not constructed primarily as art, but were rather built to serve a range of purposes including burial sites and funerary customs, aiding in the trapping of migratory animals, and as cleared areas for camps, houses and animal enclosures. Since the 1970s, numerous geoglyphs have been discovered on deforested land in the Amazon rainforest, Brazil, leading to claims about Pre-Columbian civilizations. Ondemar Dias is accredited with first discovering the geoglyphs in 1977 and Alceu Ranzi with furthering their discovery after flying over Acre. Other areas with geoglyphs include Megaliths in the Urals, South Australia (Marree Man, which is not ancient, but rather a modern work of art, with mysterious origins), Western Australia and parts of the Great Basin Desert in the southwestern United States. Hill figures, turf mazes and the stone-lined labyrinths of Scandinavia, Iceland, Lappland and the former Soviet Union are types of geoglyphs. More than 50 geoglyphs are found in Kazakhstan. In the UK are various equine and humanoid figures cut into chalk hillsides. 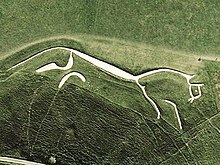 Examples include Uffington White Horse, Westbury White Horse, Cherhill White Horse, Cerne Abbas Giant, and the Long Man of Wilmington. Bunjil geoglyph at the You Yangs, Lara, Australia, by Andrew Rogers. The creature has a wingspan of 100 metres and 1,500 tonnes of rock were used to construct it. Not all geoglyphs are ancient. The Land Art movement created many new geoglyphs as well as other structures; perhaps the most famous example is Spiral Jetty by Robert Smithson. Many towns and cities in the Western United States use hillside letters (also known as "mountain monograms") on the hills above their locations. Contemporary Australian sculptor Andrew Rogers has created geoglyphs around the world called "The Rhythms of Life". You Yangs National Park is the home of a geoglyph constructed by Rogers in recognition of the indigenous people of the area. It depicts Bunjil, a mythical creature in the culture of the local Wautharong Aboriginal people. Portrait of Genghis Khan painted onto cleared areas of Mt. Bogd Khan in Mongolia in 2006. Geoglyphic texts and images are common in Central and Inner Asia but there has been little systematic study of their origins and spread. In 2008–2009 Alfie Dennen created Britglyph, a locative art focused Geoglyph created by having participants across the United Kingdom leave rocks at highly specific locations and uploading media created at each location. When taken together and viewed on the main project website an image of a watch and chain inspired by John Harrison's marine chronometer H5 was created. People have used the Strava mobile app to create Strava art, virtual geoglyphs. ^ Kennedy, David (2011). "The "Works of the Old Men" in Arabia: remote sensing in interior Arabia". Journal of Archaeological Science. 38 (12): 3185–3203. doi:10.1016/j.jas.2011.05.027. ^ Martti Pärssinen, Denise Schaan and Alceu Ranzi (2009). "Pre-Columbian geometric earthworks in the upper Purús: a complex society in western Amazonia". Antiquity. 83 (322): 1084–1095. doi:10.1017/s0003598x00099373. ^ "Unnatural Histories – Amazon". BBC Four. ^ "Mysterious Ancient Geoglyphs Discovered In Kazakhstan Leave Archeologists Perplexed". IFLScience. ^ Dennen, Alfie (2009-03-11). "Britglyph". Moblog. Archived from the original on 2008-12-18. Retrieved 2009-03-17. ^ "The geoglyphs of Har Karkom (Negev, Israel): classification and interpretation" (PDF). ccsp.it. Retrieved 30 July 2018. Aquizium - Curious World: The Top Ten Geoglyphs - Worldwide — Curious Britannia Ltd.